Well Euan didn’t want one, but I’m not so fussy 🙂 she stayed with me for a week and I’ve just handed the A8 over to a DHL man to carefully take back to the Toshiba marketing folk. Let me first be clear about the basis on which I took part. I wasn’t paid anything for this, I just got a loan of a new laptop for a week. Toshiba covered the cost of couriering the machine to and from me. 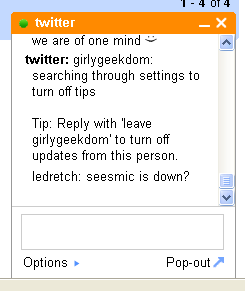 I gave up being nerdy and spec-obsessed a long time ago (well the spec-obsessed part anyway) so I can’t reel off lots of geek-speak about it, and my current laptop is a Tosh Satellite, so that was my main point of comparison. A week really isn’t very long to try it out. I was working hard when it arrived so didn’t have time to play until a few days in. I wish though that I’d taken the time because actually it was so much faster than my Satellite that I could have got things done much more quickly…. The speed comes courtesy of a dual core processor, 1GB of RAM and a 95GB hard drive. Weight-wise, it was like all laptops – heavier than you want it to be. 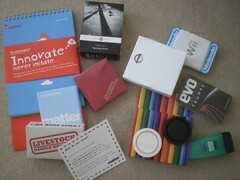 It was wide enough to fit in my social media empire bag but only just and made getting other kit in and out tricky. But the screen did feel pleasantly wide. It worked fine with everything I do (though for a 1 week trial it was a bore to have to download and install my staples of Firefox, Audacity, SonicStage, The Gimp & Core FTP), and far faster than any of the other machines I have to hand – in fact I was gobsmacked by how quickly video got processed. But without experience of other similarly-specced machines, I can’t say for certain whether this is the *best* choice of dual core/1GB/95GB option. This really isn’t about this machine, it’s about me. I hanker for something prettier and more out-of-the-box functional and useful for what I do, or else a big change from my usual environment. If I’d had longer, I’d have tried installing Ubuntu – that might have made for a more interesting review, but it might also have ruined my all of my personal and business relationships while I sat engrossed in tweaking device drivers. If you ever want to go to a meeting I’d be happy to take you. They’re at it again. I thought I saw Jason saying nooooo-waaaaay Rosé to this but nevertheless Hugh’s just announced The Stormhoek/Threshers 40% off voucher for getting shitfaced by Easter (well April 1st anyway – uh-oh that date rings alarm bells). 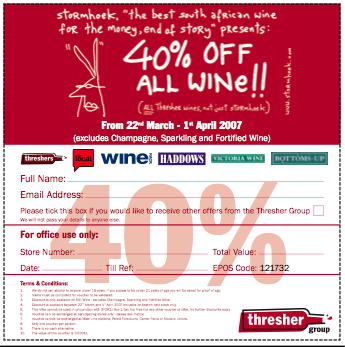 Download the coupon from here and take it to Threshers for 40% off – yes really. Now you know that I don’t drink, but that doesn’t make me a spoilsport – 40% off is, like, a lot. You don’t need me to remind you what happened last time.